Extract of a letter from Bury, May 19. Wednesday morning, about five o'clock, a fire broke out at a new erected farm house situated on Culford Heath (the property of the Right Hon, the Earl Cornwallis,) which in a short time consumed the same; the flames were so rapid that two cottages, (also newly erected) were consumed; by which the poor cottagers lost their all, and two children were with much difficulty saved. Also this morning the church of Fornham St. Jenoveve, was burnt down, except the bare wall. The former was occasioned by the chimney catching fire and communicating to the thatch. The latter, by means of a gun being fired at some jack daws which had lodged on the steeple; the wad lodging in the thatch, the church was very soon on fire, and as soon consumed; one of the bells broke in falling; the large engine was sent from this place, and kept constantly playing on the house of Charles Kent, Esq; a very elegant seat, near the church, which escaped the rapidity of the flames. Here lyeth the body of Mrs. Eliz. Tyldesley, who died 31 Jan., 1727, ætatis suæ 27 ; also Mrs. Mary Tyldesley, 25 Mar., 1728, ætatis suæ, 25. Requiescant in pace. Elizabeth and Mary Tyldesley were two of the daughters of John Tyldesley who was born in 1655 and died in 1723. John Tyldesley was originally of Stanzacre in Lancashire and it is not known what caused him to move to Suffolk. He married Catherine Stafford and appears to have had at least five children: Frances, John, Elizabeth, Mary and William. Like all Tyldesleys at that time, John Tyldesley was a recusant Catholic. As a consequence his property is itemised in the Registry of the Papists Estates within the Division of St Edmunds produced on 29 April 1719. The tenants of his property in Fornham St Genevieve are named as John Flowerdew, Nathaniel Marchall, Thomas Osborn, William Langham, John Bloise, Joseph Johnson, Robert Batrum, John Cooke, William Leppingwell and Ellis How. Estcourt records that John Tyldesley died on 18 February 1723 at the age of 68 at the Lodge in Lancashire. John Tyldesley's son—also John Tyldesley—married Jane and had at least two children, Frances and Bridget. Bridget Tyldesley was to marry Francis Hanne and have a daughter, Bridget Hanne. Details of the Hanne family are available from Eddie Hann's Hann Family History site. Antonius Tyldesley—Anno Dmni 1718 die 24ta Julii In Anglia dum animarum Saluti incumberet oibus S : Matris Ecclesiæ Sacramentis munitus pientissime Obiit P : F : Antonius Tyldesley Lancastriensis ætatis suæ 32 : Relig : 15 : Sacerd : 8 : missionis 5 : Sepultus est in Ecclesia Parochiali Sti Edmundi Bury In Suffolcia. R.I.P. 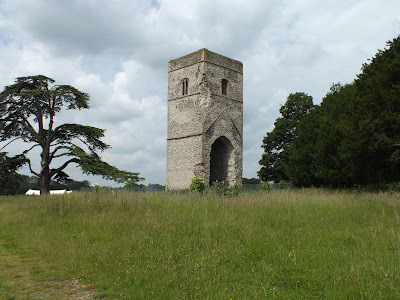 Further information on the Church of St Genevieve and many other churches in Suffolk is available from Simon Knott's excellent Suffolk Churches site.